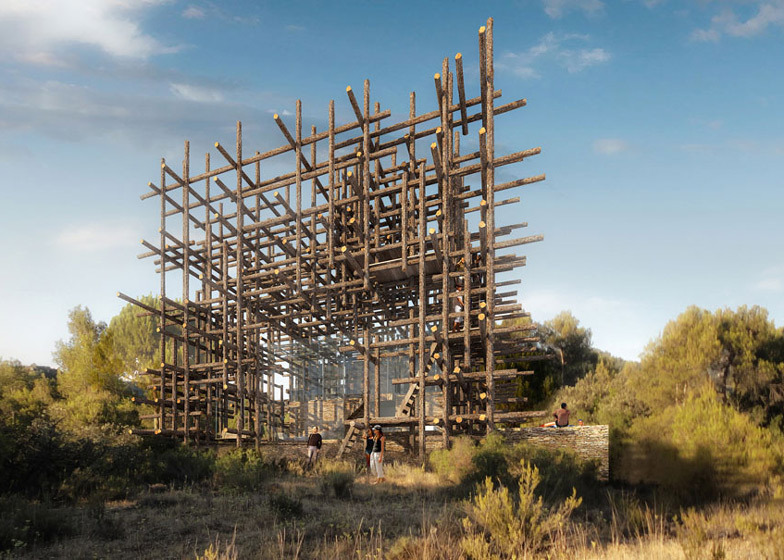 Japanese architect Sou Fujimoto has designed a house encased in a lattice of giant sticks as part of a series of dream houses proposed for Spain's Matarraña region (+ slideshow). 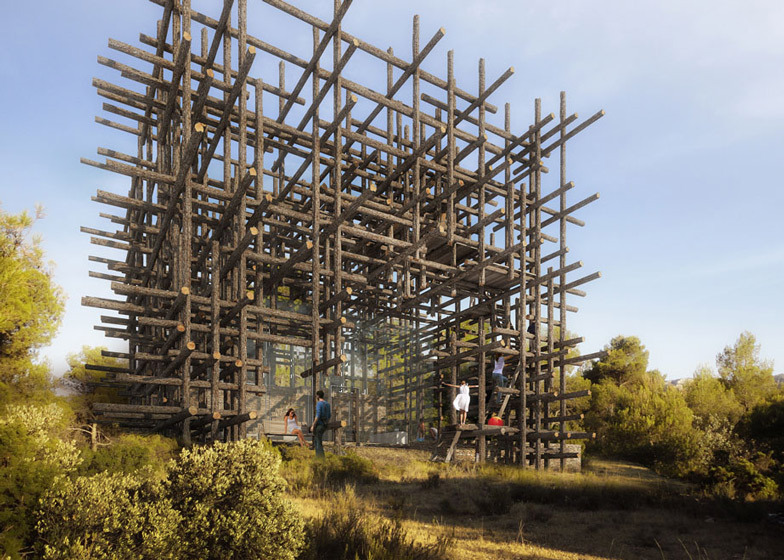 Sou Fujimoto is one of 12 architects that has been commissioned by French developer Christian Bourdais to create a holiday home for the Solo Houses series, and was given carte blanche to come up with any concept within a set budget. 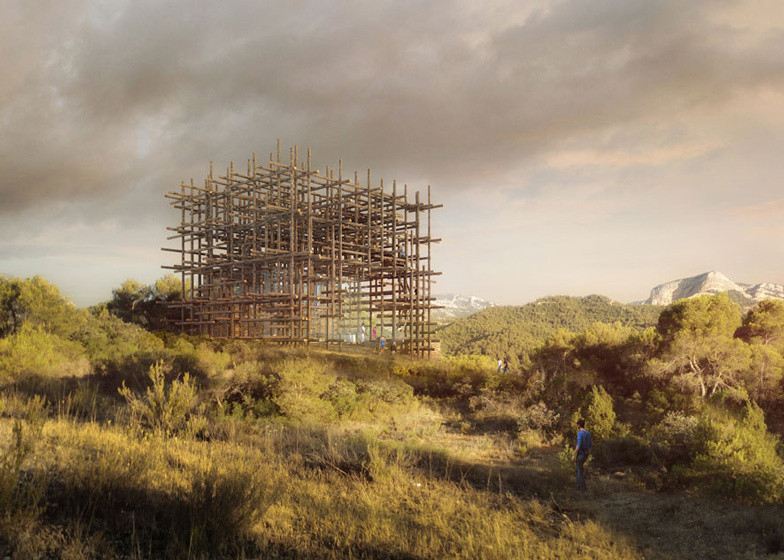 Named Geometric Forest, the proposed house will comprise a two-storey stone and glass volume, enveloped on all sides by a complex framework of interwoven logs. 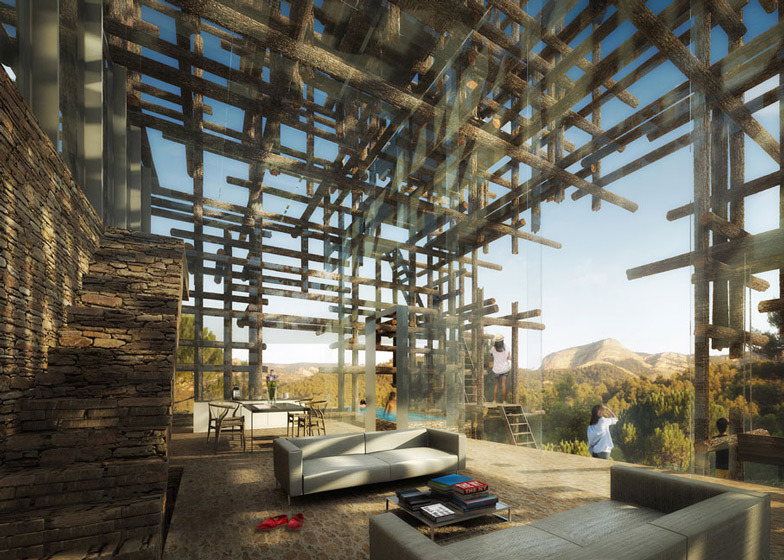 Residents will be able to clamber between floors by using the lattice as a climbing frame, but will also be able to use the structure as shelves for displaying plants and other items. According to the architect, it will be "simultaneously enclosed and protected, as well as completely open", allowing wind and sunlight to filter through its walls. The house will be the architect's first residential project in Europe, but will follow similar design principles to the Serpentine Gallery Pavilion he completed earlier this year in London's Kensington Gardens. These ideas derive from the architect's concept of "primitive futures", which looks at the origins of architecture and borrows forms from humble caves and animals' nests. So far only one house has been completed in the Solo Houses series - the symmetrical concrete Casa Pezo by Chilean studio Pezo Von Ellrichshausen. A total of 12 are proposed and include designs by Didier Faustino, Johnston Marklee and Takei Nabeshima. Simply put, this house is like a geometric forest. Combining untreated wood in its natural form in an irregular lattice to create a loose boundary. Natural breeze flows through the gaps, and strong summer sun is shielded by this loose lattice structure; between nature and artificiality. A place both loosely protected and at the same time, thoroughly open. One is able to physically climb through this lattice, to the upper part of the structure is a space like a sky-terrace where one can find a place of refuge. Move through the space like climbing a tree. The gaps, or spaces between the lattice structure can be used as shelves, or a place for your favourite pot-plant. A place to live, can be re-written as a place filled with opportunities or cues where one can engage, it is also a place to harness and invite elements such as wind and sun to orchestrate a pleasant space. This forest of lattice structure will be place for living which is new yet primitive.